Serving Muncy, Montoursville, Williamsport, Montgomery, Hughesville, and beyond! …You’ll be glad to know that Brelsford Motors & Equipment Co. is an authorized agent for LifeSafer™, the ignition interlock industry leader for over 2 decades. Their user-friendly devices use proprietary fuel-cell sensor technology for precision that is far superior to commonly used law enforcement equipment. 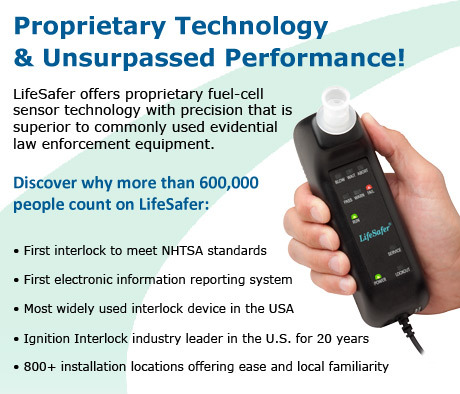 The LifeSafer™ FC100 is the most widely used alcohol-specific ignition interlock device in the U.S. today. It features a removable/sanitary mouthpiece, instructional indicator lights, an audio indicator, and multi-language written messaging. It is lightweight, Velcro mounts to the dashboard, and fits easily in the user’s hand. The device enables a person to stay employed, undergo treatment, and go about his or her daily activities in lieu of going to jail. It’s fulfilling legal obligations with dignity and we’ll take care of it for you with no hassle and no questions asked at Brelsford Motors & Equipment Co.
Let our experts install Interlock properly for you, help you fulfill your duty, and gladly get you on your way!